Yogasana is the most eco-sustainable yoga mat made. 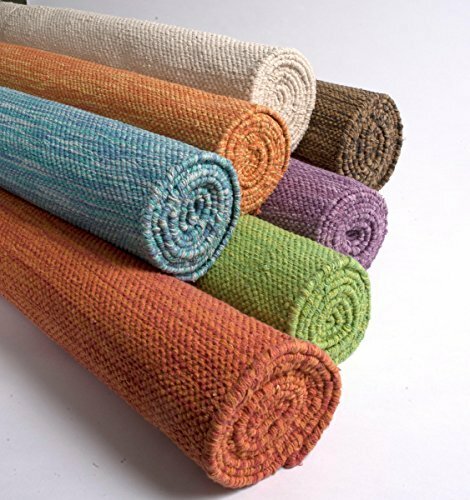 Our mats are hand-made in the region of India where yoga began. The Yogasana story begins in 15th century with Saint Kibir a mystic poet who earned his living as a weaver. The weavers of Benares have continued the tradition to this day. Our weavers are part of the professional lineage of Kibir. Each mat takes 10 days to make, all by hand. The signature of the weaver on the mat represents the 'hand-off' from his hands to yours. Our foundation, Yogasana Circle, gives back to support the education of the children of the workers who make our mats...We believe the karma is good! 100% cotton provides superior grip. When you sweat- YOU GRIP. On plastic/rubber mats, when you sweat - YOU SLIP. Our mats excel with all types of yoga: Hatha - Vinyasa - Restorative - Hot - Iyengar - Kundalini - Prenatal - Yin - Viniyoga. Woven to 72" x 25" our mat is longer and wider than standard mats. Our mat does not deteriorate in the sun. our mat travels well - weighting just 4 lbs.They're easy to wash in cold water. Line dry. Our mat is ¼" thick and gets softer over time. Yogi Testimonials: "A great alternative to synthetic mats." Angie Richter "Transition to transcendence! Love my new Yogasana mat especially the smell and feeling from the natural cotton." Patrick yogi from Norway "I highly recommend these mats for all those who practice asana and love the feel of nature as they practice." Gary Kraftsow Founder and Director of the American Viniyoga Institute "I love the color and Feel" Shiva Rea - Founder of Samudra Global School for Living Yoga "This mat truly feels like sacred space" Amber Campion - Founder of Yogaeira You want to endear yourself to a friend who practices yoga? Purchase a Yogasana mat as a gift. You will be at the top of her list forever...guaranteed!